Home > Healthy Ears > Can Earphones Damage Your Hearing? It is well known that long term exposure to loud noise can damage hearing, sometimes so severely that it can induce deafness. Noise in the workplace is one of the most common causes of hearing impairment and teenagers have been warned about the dangers of loud music at pop concerts for as long as pop culture has existed. Today, there is a new danger and few people probably realise that they are unintentionally damaging their hearing just by listening to an mp3 player or ipod through earphones at high volume for just an hour every day. A recent study by scientists looking at emerging health risks in Europe concluded that using earphones and playing loud music every day for five years could cause permanent and irreversible hearing problems. Five years seems like a long time, but listening to music through ear phones for longer each day would have the same effect in a much shorter time. Current legislation limits the maximum noise output of mp3 players to 100 decibels, but listening to music at 89 decibels regularly is still dangerous. To put it all in context, someone who listens to their mp3 player through earphones on the highest volume for 5 hours get a dose of noise that is more than that allowed by the Health and Safety regulations for factory workers. Playing music through an mp3 player directly into the ear at over 100 decibels (which some of the less reputable ones may be still able to do) is as damaging as standing 3 metres from a pneumatic drill. What Type Of Earphones Are Dangerous? 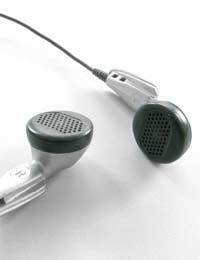 If the music is loud enough, all types of earphones have the capacity to deliver noise that will damage hearing. However, the ‘earbud’ design of earphone, which are inserted into the ear rather than just sitting on top of the pinna (the fleshy part of the ear) are more dangerous because they force the sound directly towards the eardrum. Often described as noise-cancelling earphones, earbuds prevent sound escaping into the environment close by, so that the use avoids annoying other people. Listening to music on personal players via earphones is a common practice. People routinely plug in on the train journey to work, when a passenger on a long car journey or when out jogging or walking. Estimates put the number of people at risk in Europe at between 2.5 and 10 million – and that isn’t counting all the people in the USA, China, Japan, Australia and other parts of the world where mp3 and ipod players are used widely. Teenagers who use personal music players are particularly at risk because their hearing is acutely sensitive. In the UK, the Royal National Institute for the Deaf carried out a survey and showed that at least two out of three people who use mp3 players, had their volume turned up to dangerous levels of over 85 decibels. Statistics from the Centers for Disease Control and Prevention in the USA show that around 5 million teenagers in America who are aged between 5 and 20 have some form of hearing impairment that has been caused by noise exposure. Apparently, the number of children in the USA who have problems with their hearing has increased from 13 million at the beginning of the 1970s (pre-mp3 players) to over 30 million today, which is a massive increase. How Can I Use Earphones And Mp3 Players Safely? There are several easy measures that we can all take to make sure listening to music on an mp3 player or ipod does not cause hearing damage. The most important is to check the noise level output of the player – it should provide no more than 85 decibels at the maximum setting. Even then, it is a good idea not to always listen at the highest possible volume – and remember not to turn the volume control up when ambient noise increases – forgetting to turn it down again is all too easy. Try to restrict the time spent each day listening to music through earphones, particularly earbuds. When not on the train, or in circumstances that make it impossible to listen to music any other way, play your music through speakers. If you must use earphones, take at least a five-minute rest each hour. This will provide the ears with valuable recovery time and could help reduce the risk of hearing impairment in the long term. It’s interesting to note that the older kind of headphone design, one that covers the entire ear and is cushioned, is coming back into fashion. The idea is that it gives better sound, which it does, but the side effect is that it’s much safer for your hearing as well as being far more comfortable for small ears.